Hosted by the Government of Tanzania through the Tanzania Commission for Science and Technology (COSTECH), Supported by the European Commission and African Union Commission and Technical Co-Sponsored by IEEE, IST-Africa 2012 will take place from 09 - 11 May 2012 in Dar es Salaam. Part of the IST-Africa Initiative, which is supported by the European Commission under the ICT Theme of Framework Programme 7 (FP7), IST-Africa 2011 is the seventh in an Annual Conference Series which brings together senior representatives from leading commercial, government & research organisations across Africa and from Europe, to bridge the Digital Divide by sharing knowledge, experience, lessons learnt and good practice and discussing policy related issues. IST-Africa 2012 will focus on the Role of ICT for Africa's Development and specifically on Applied ICT research topics addressing major societal and economic challenges, which is part of the European Commission's Information Communications Technologies (ICT) Theme of FP7. The Conference Programme combines strategic keynote presentations, technical and policy papers, case studies, workshops, an exhibition and social activities. In the context of focusing on the Role of ICT for Africa's Development, the Opening Plenary on Wednesday 09 May will feature a high level dialogue on Implementation of the Africa-EU Partnership on Science, Information Society and Space. The Closing Plenary on Friday 11 May will focus on Initiatives Supporting Development of Regional Science, Technology and Innovation. Tanzanian researchers, government officials, SMEs and relevant NGOs who are working in the area of applied ICT and do not have projects to support their participation are invited to apply for a Waived registration fee. Please fill out and submit the application online before 20 April. The number of waived registration fees to be offered will depend on available resources. Please clearly state why you should be supported and specify ongoing ICT initiatives being undertaken. The Joint Expert Group (JEG8) for the 8th Africa-EU Strategic Partnership for Science, Information Society and Space is being hosted by the Government of Tanzania through the Tanzania Commission for Science and Technology in association with IST-Africa 2012. The IST-Africa Living Labs Thematic Working Group Meeting is participatory in nature and requires participation for the full day (11:30 - 18:00). Pre-registration is required as part of IST-Africa 2012 Conference registration. 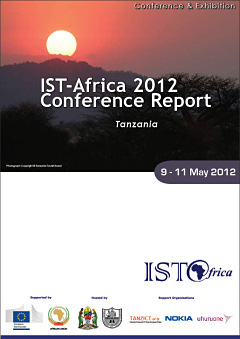 The Scientific Programme for IST-Africa 2012 is based on an open Call for Papers which closed in late November 2011. The Final Programme consists of two plenary sessions and 48 parallel sessions featuring over 180 presenters from government, commercial and research organisations in 39 countries. The goals of the IST-Africa Conference Series are Community Building to facilitate EU-African research cooperation and successful exploitation of research results, to stimulate take-up of RTD results by industry, Small and Medium Sized Businesses and the public sector, to promote knowledge sharing between commercial organizations, government agencies and the research community, to exchange experiences about the current state of eAdoption at a sectoral, national or regional level, support International Cooperation and open up the European Research Area (ERA) to Africa.